What? 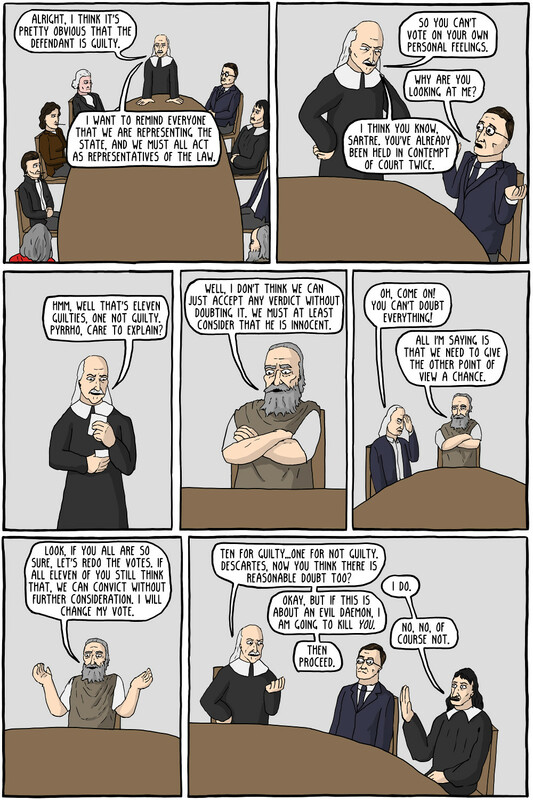 You didn't expect twelve philosophers to agree on something did you? This comic is a parody of the classic film Twelve Angry Men. Here they are the jury for Socrates, when he was convicted of corrupting the youth of Athens, and sentenced to death. Hobbes's philosophy is largely based around why people should obey the law of the land that they are in. His justification is basically that because they stay in the state voluntarily, and the benefit from its security and infrastructure, they have entered in to an implicit social contract to obey its laws. This is somewhat similar to the explanation that Socrates himself gave of why he must accept the death penalty. Pyrrho was an ancient skeptic that believe you should not commit to any one view, since you can never be completely certain of anything. Descartes is best known of his "methological doubt", where he attempts to doubt everything. At the end he said even the world we see could be doubted, since there might be an "evil daemon" that is deceiving us into believing it all. Camus said that in his novel The Stranger two murders were committed - one by Meursault, and one by the State. In his essay The Rebel he outlines why he believes humans must sometimes rebel against the state. Arendt's line is a reference to her work Eichmann in Jerusalem, where she supported giving Eichmann the death penalty, despite normally believing that the state never has the right to kill human beings. She justified it by saying that Eichmann had basically revoked his humanity by his participation in the holocaust. Protagoras was an ancient Sophist, and one of the adversaries of Socrates in the Socratic dialogs. He is taking the part of the character in the movie who wants to convict based on his prejudices. 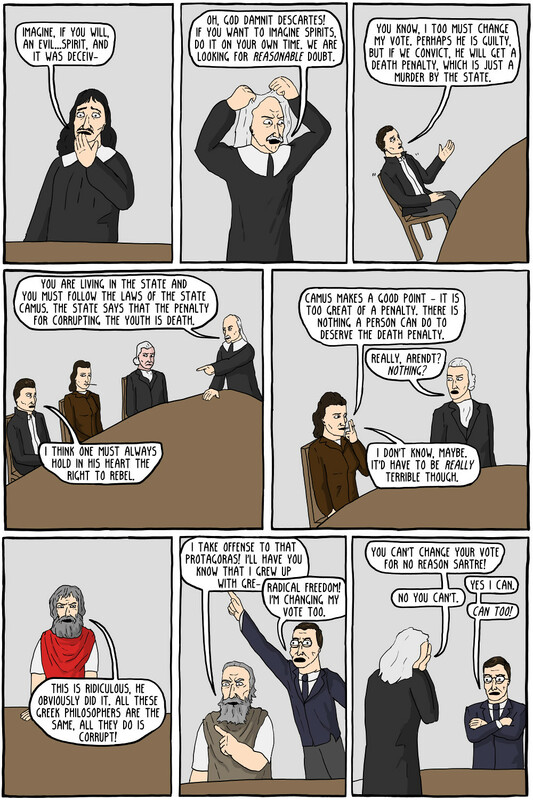 Jean Paul Sartre yells "Radical Freedom" and does something random in most of my comic. People say the joke is getting stale, but unfortunately I have radical freedom too, and no one can make me stop using it. 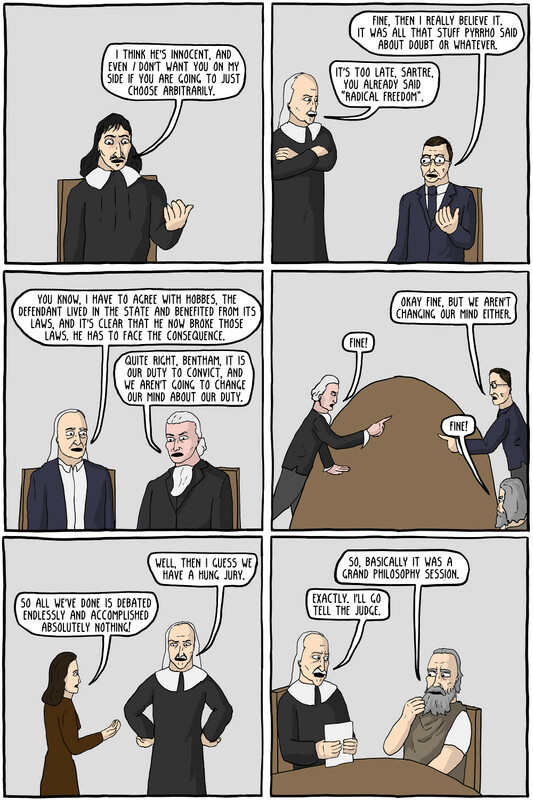 Bentham and Kant were pretty much filler characters.